A re-print of a recent Guardian Comment is Free piece written by a Deliveroo rider discussing the need for organisation and action to improve conditions on the job. I started working for Deliveroo in Brighton last summer. At first, it wasn’t a bad job, but month by month I noticed my earnings declining. We’re paid £4 per drop, with no hourly rate, and I was having to wait longer and longer for each new order. Even though I was getting more efficient and learning how to get around the city faster, I was making a lower hourly rate. Now it’s got so bad that last Saturday I made £12 between midday and 7pm. That’s £1.71 an hour. Minus costs such as bike maintenance and phone data, I earned practically nothing for seven hours’ work. That’s not an unusual story. Average wages have been nosediving for all the couriers. Supposedly “peak” hours can pay less than minimum wage, and some evenings 25-plus couriers hang around at our zone centre, desperate for orders. Deliveroo don’t care if we’re all waiting around: with no hourly wage our time costs them nothing. But the lack of work isn’t the only problem. After an accident last month I was unable to work for two weeks and had a smashed phone screen. Because Deliveroo gives us no sick pay and no insurance, I had to foot the cost of lost wages and repair myself. All told, one accident ended up costing me over £200. Being a bike courier is a dangerous job, and accidents like this aren’t uncommon. In this context, it’s no surprise that we started to get organised. In November, riders started distributing the Rebel Roo, a self-organised bulletin that spread info about strikes and the fight for better wages and conditions by Deliveroo riders. By January, we had set up a first meeting and met with the grassroots Independent Workers Union of Great Britain (IWGB), who agreed to represent us. Things escalated quickly from there. The next Saturday, 4 February, there was a spontaneous strike that caused multi-hour delays for deliveries and cut order volume by about 50%. During the strike we held an assembly to come up with demands. Forty of us decided on three things. First, a higher pay-per-drop rate of £5, to give us a living wage. Second, a hiring freeze, to create more work for the couriers already working for Deliveroo. Third, no victimisation of trade union activists. 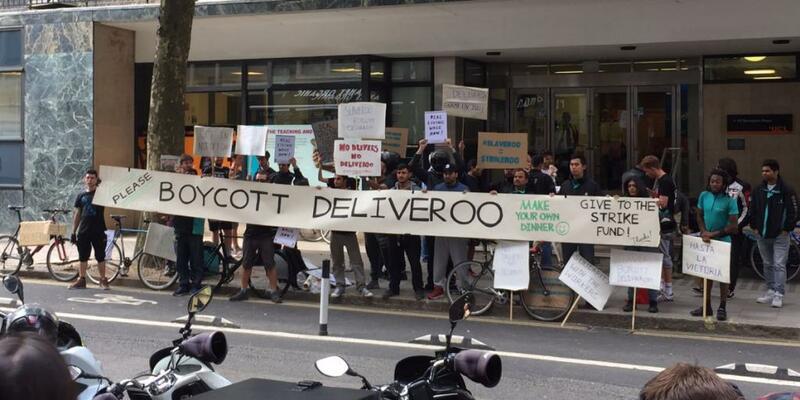 The IWGB gave Deliveroo an ultimatum: they had two weeks to meet our demands, or we would start a campaign. Within two weeks Deliveroo wrote to riders confirming they were not taking on any new recruits, but pay stayed the same, and so when the two weeks ran out we began a campaign. Immediately an ITV investigation featuring Brighton riders was released, followed by public meetings, the support of the shadow chancellor John McDonnell and, on Tuesday last week, a mass bike ride protest with Deliveroo riders and supporters coming together to demand a living wage and £5 per drop. Along with a similar campaign by the Industrial Workers of the World in Leeds and Bristol and the strikes last summer in London, we’re proving that the only guaranteed way to improve conditions in the so-called “gig economy” is through the organisation and action of the people who work in it. Our next protest is another mass bike ride tomorrow afternoon. We’re going to bring together workers and supporters in a coalition to demand better wages and conditions in the so-called “gig economy”, and continue to fight for a living wage. If Deliveroo won’t listen, we are willing to go on strike again. If Deliveroo won’t listen, we are willing to go on strike again. Thanks for writing this up. Good luck. Stormzy being too big for his boots?